During the October Break I visited the Kunskapsskolan, or The Knowledge School of Helsingborg, Sweden. My friend Maria teaching Humanities at school which has grades 6 – 9, and is approximately equivalent to an American middle school. The school is very different in that the student controls his/her own education and they do not have regular classrooms. Students go through 35 “steps” in each subject and keep track of their progress on line and in a log book. There are regular lectures for groups of students, but most of it is self-paced. I was given a tour of the school by two ninth grade students. It was fascinating to see how the system works. The two boys really liked it and felt it prepared them quite well for high school. I was impressed with one of them, who showed me he needed to complete two more steps to gain enough points to get into the high school of his choice. The students go as fast as they can through the steps and must pass a written and oral exam at the end of each step. One complaint from the boys was that it was relentless and there was always another step and not enough time to rest. They also mentioned Gustav, the smartest boy in the school who completed the steps in this grade 8 year and has spent the last year working on independent projects. When I asked them, is this the future of schools, they were quick to say no. They mentioned that since sixth grade, about 50 students left the school because they could not handle the independence and left to attend more traditional schools. For those who can however, it is the best. I would have loved to attend a school like this because I remember being bored to death in many of my classes. The ability to work at my own pace and vary up the rooms or my schedule would have been wonderful for me, as I was quite active and needed to move quite a bit. I wonder if I would have had the maturity to handle it? The teachers too enjoyed working in this system and I saw many working 1-0n-1 with students or in small groups. Typical Sweden, the Principal was not at school that day as this year he is working part-time so he can finish building his house! This would never be the case in the USA. The architecture and design was stunning! Sweden and Denmark are known for this. 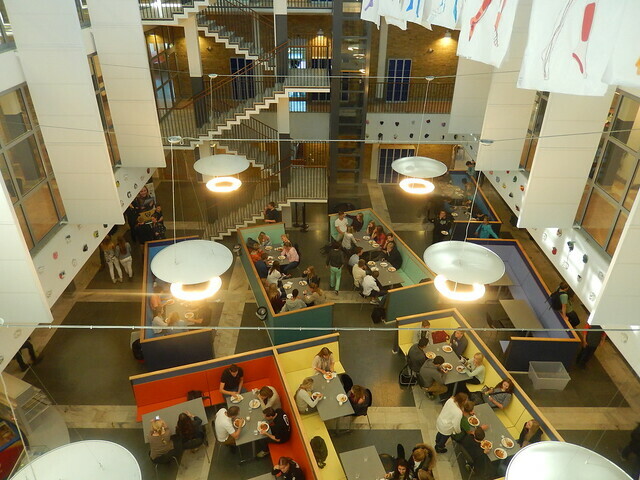 The photo above was taken from the third floor looking down onto the cafeteria. There were also some great study nooks in the stairwells of the school. I was happy to have the opportunity to give two lectures to grade 9 classes about the United States political system. They were very interested in the recent government shutdown and the differences between the Democratic and Republican parties. This particular school is one of 28 schools run by the non-governmental foundation Kuskapsskolan. They are also expanding into other countries including the UK, India, and the USA. The global web site has a lot of information. The visit really inspired me to try to incorporate more of this Mastery Learning or Individualization into more traditional schools. I see schools moving more to this model, especially with the proliferation of on line learning. It just makes more sense to have the student himself/herself control the time of learning instead of a predetermined yearly calendar or timetable. As good teachers know, there is a wide range of abilities and interests in any class. This excerpt from the New York Times gives an American perspective of Mastery Learning. I would like to thank Maria and the students for their hospitality and allowing me to spend the day with them!